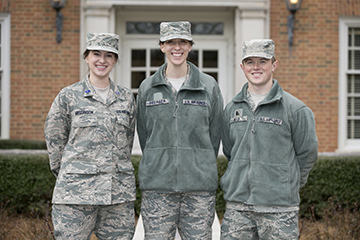 Three Samford University students were recently selected for very competitive national Air Force ROTC scholarships with a total value of $195,525. Fewer than 10 percent of all AFROTC cadets from around the nation were selected for scholarships this semester based on academic and leadership performance, so their selection highlights the quality of cadets at Samford University’s Detachment 012, according to Travis Dixon, detachment commander and Samford professor of aerospace studies. Amelia Megginson, a freshman computer science major from Birmingham, and Catherine Doerger, a freshman international studies major from Knoxville, Tennessee, were awarded scholarships that will pay them both $63,000 in tuition expenses, $15,100 in personal stipends and $2,100 in textbook allowances over their next three and a half years. Megginson and Doerger will submit their Air Force job preferences from a variety of professional career fields during their junior year and will be notified of their selection during the first semester of their senior year. Ryan Neck, a junior history major from San Diego, California, was awarded a scholarship that will pay him $27,000 in tuition expenses, $7,225 in personal stipends and $900 in textbook allowances over the remainder of his studies at Samford. As part of his scholarship award, Neck was selected as an Air Force nuclear intercontinental ballistic missile operations officer. Upon completion of their studies at Samford, all three cadets will be commissioned as second lieutenants and serve at least four years in the U.S. Air Force. Emily Duval is a journalism and mass communication major and a news and feature writer in the Division of Marketing and Communication.